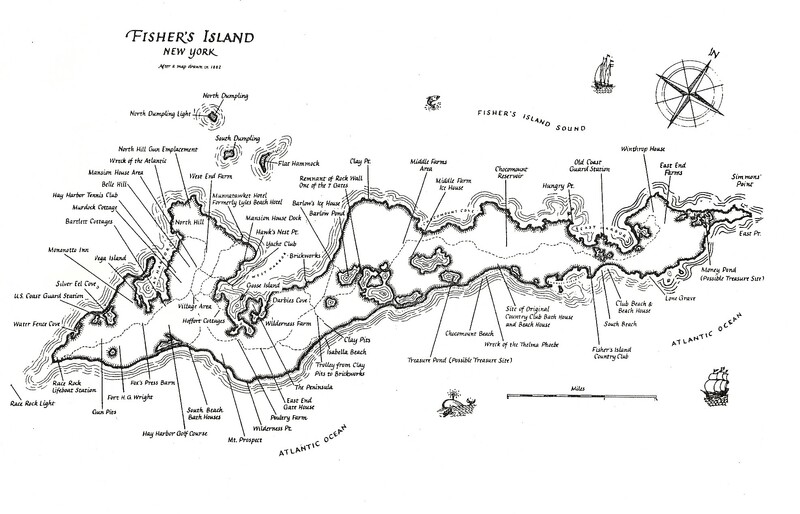 Fishers Island, New York, located at the eastern entrance to Long Island Sound, lies approximately two miles off the southeastern coast of Connecticut opposite Stonington. Regular passenger and auto ferry service connects the Island with New London, CT (45 minute boat ride) while smaller commuter boats run back and forth to Fishers from Noank, CT, on weekdays only, primarily carrying workers (20 minute boat ride). As a seasonal resort, the Island’s population fluctuates greatly. The year-round population was 236 in the 2010 census.  This off-season number increases to several thousand during peak summer periods. Although Fishers Island is geographically close to the Connecticut coast, it is politically a hamlet of the Town of Southold, NY, at the eastern end of Long Island. This unusual arrangement can be traced to the Duke of York’s 1664 land patent, a document that trumped Connecticut’s prior claims to the seven-mile long island. The bitterly disputed boundary line wasn’t finally settled until 1879/80. The grand hotels of the last century are gone, two of them victims of the Great Depression, and no single family owns the land, but Fishers Island remains very private, and nourishes its relatively quiet pace of life. Although the community is small, Fishers Island is supported by a wide range of Island institutions, organizations and businesses. There are four churches on Fishers Island: St. John’s Episcopal Church (founded 1881), Fishers Island Union Chapel, U.C.C. (1898), Our Lady of Grace Church, Roman Catholic (1905), and Church of the Rock (2012). Fishers Island School is a pre-K to 12th grade New York public school with some 70 students, approximately half of whom commute from New London to Fishers Island. The School provides students with a “high quality” core curriculum in addition to a wide range of required and self-selective courses in the arts, career development and occupational studies, health/physical education/family and consumer sciences, and STEM. Students are also offered the opportunity to broaden their learning experiences beyond the classroom. They can take advantage of an array of co-curricular and extracurricular activities within the school environment and the extended Fishers Island community. The Viking sports teams compete with local mainland schools in cross-country, basketball and golf. The Island has a grocery store that is open year-round and a deli-style market that opens during the peak season. The Island has two realty companies, two gas stations, a marina, a hardware store, two art galleries, and two bike rental shops. There are several major landscaping firms and general contractors. The small town center features three gift stores, a liquor store, and an ice cream store. Anchoring town green is the Fishers Island Utility building with the Fishers Island Post Office located on its first floor. Other venerable Island establishments include the American Legion, open year-round, and the Pequot Inn, (currently closed) with food, drink, open six months of the year. Although lobstering is not what it once was on Fishers Island, there are still several lobstermen plying their trade. The Fishers Island Oyster Farm, established in 1959, is the island’s only remaining major farm and only product exporter. Emergency services are provided by the all-volunteer Fishers Island Fire Department and associated EMTs. A “Sea Stretcher” ambulance boat is utilized for emergency transportation to the mainland. Health care is made accessible to island residents and visitors by the Island Health Project, a vital non-profit organization that funds and manages a medical office near the center of town that has an associated full-time doctor who lives on Fishers Island. The Island’s law enforcement is provided by year-round constables who are assisted throughout the year by New York State Troopers. Fishers Island Ferry District provides public marine transportation services from Fishers Island to New London year around via the Race Point and Munnatawket ferries. The District also manages property owned by the Town of Southold on Fishers Island including the Parade Ground, the theater, and the airport. Elizabeth Field, a former military airfield with two asphalt-paved runways, is situated at the western tip of the Island. Fishers Island Waste Management Tax District (FIWM) “is committed to the safe and efficient disposal of household garbage, furniture, appliances, recyclables, construction waste, yard and landscaping debris”. The private clubs on Fishers Island include the Fishers Island Club (also known as “the Big Club”), the Hay Harbor Club, and the Fishers Island Yacht Club. To learn more about Fishers, please visit the links below and explore the website.